Agricultural drones don’t get the attention they deserve. Aside from all the flash of “personal transportation vehicles” and weighty debates over privacy, unmanned air vehicles (UAVs) are quietly transforming what has for millennia been one of the most labor-intensive and important jobs on Earth: farming. Drones have been used in agriculture since 1987, when Yamaha released a rotary-wing crop-sprayer called the R-50 (the company still sells its descendent, the RMax). But only recently have unmanned systems become practical enough for widespread use, and farmers are jumping in enthusiastically. Today’s drones can’t replace farmers—many of whom are already surprisingly high-tech, with automatic GPS-guided seed planters and sophisticated data-driven analysis—but they can make their lives easier and cheaper. Drones are increasingly replacing traditional aircraft in crop dusting, technically known as “aerial application” of herbicides, fertilizer, pesticides, and even seeds. Because drones fly lower and slower than manned crop dusters, they can spray crops much more efficiently and accurately, reducing costs to the farmer, mitigating pesticide drift, and reducing the chance of accidents. The other big use of drones is precision agriculture, which pinpoints exactly what sections of field need what kind of help, including precisely locating pest infestations, mapping invasive weeds, measuring soil moisture and plant respiration, etc. Such precise treatments were until now dependent on ground-based sensors—including the eyes of knowledgeable people—which took a long time to survey large areas. Today drones can do the same job from the air in significantly less time. No need to set up instruments at precise intervals or walk the fields yourself. With small, relatively inexpensive systems, farmers can gain unprecedented levels of real-time information about their crops. A 2016 report on the future of drones by PricewaterhouseCoopers identifies agriculture as the second most lucrative market for commercial drones (after infrastructure), with a potential value of $32.4 billion per year. 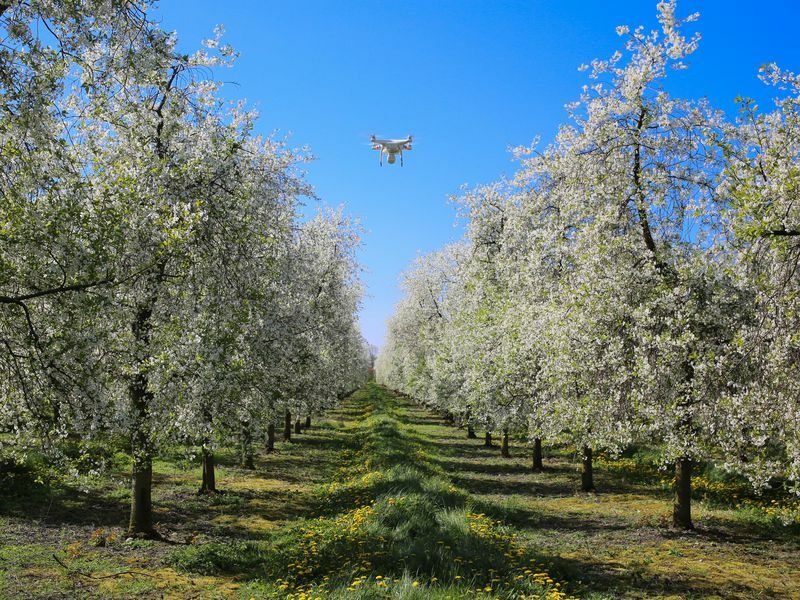 Other research by groups such as Bank of America, Merrill Lynch, and Goldman Sachs also point to multi-billion dollar growth in the agriculture commercial drone market. With increasing technological advancements, drone use on the farm will continue to expand, and will come to include aerial systems integrated with land-based automated systems, for everything from field preparation to harvesting. Because of drones and land-based automated systems, one day a farmer may need to do nothing more than type a few commands into a computer and then watch as the crops mature to harvest.